In the lead up to menopause (peri-menopause) the body naturally changes the amount of hormones produced. Estrogen levels reduce, but the body stops producing progesterone altogether. This leads to ‘estrogen dominance’ a condition identified in the early 1990s by US physician John Lee MD. What is Estrogen Dominance and why is it a Problem? 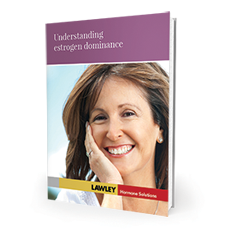 Estrogen dominance is the term used to describe the imbalance in the female body between estrogen and progesterone. Progesterone is essential to balance out the negative effects of too much estrogen. During menopause, progesterone is no longer produced and so there is nothing to combat the negative effects of estrogen. You may experience only one or two of these symptoms. Correcting the imbalance, and addressing the lack of progesterone, will usually get rid of symptoms within a few months. To find out how progesterone deficiency is diagnosed please go to the next page.